If you have a stash of trims you’ve been lying to yourself about for years – waiting for the perfect project for them to miraclously arise – then redemption is finally here. 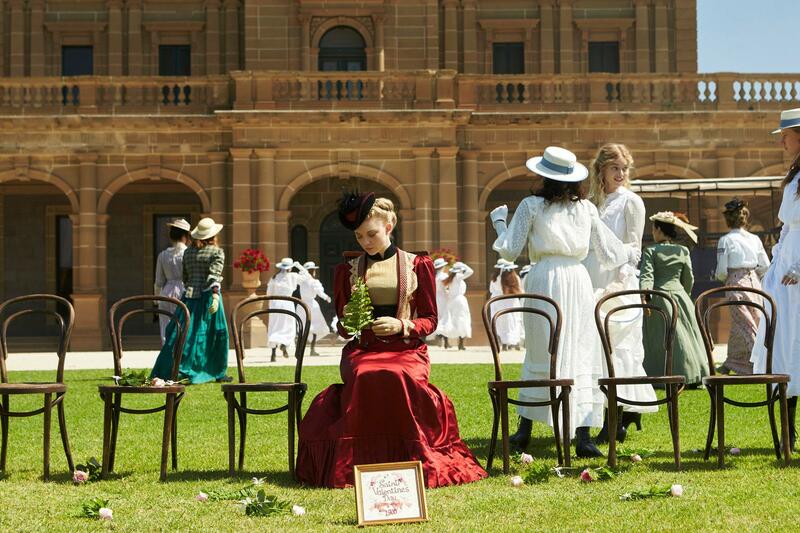 Amazon’s new production of Picnic at Hanging Rock stars Natalie Dormer as stern headmistress Mrs. Appleyard amidst the disappearance of several schoolgirls and their teacher during a picnic at Hanging Rock, Victoria on Valentine’s Day in 1900, based on the 1967 novel by Joan Lindsey. Before the girls leave for the picnic they take a group photo with Mrs. Appleyard, whose red dress stands out against their white dresses of innocence. The production’s costume designer Edie Kurzer has discussed the nuances created by these colour choices but one detail stood out not for its subdued connotations but for its very real backstory. The effect that vintage lace has on the outfit is profound with dainty patterns arranged in a prickly, saw-like shape perfect for Dormer’s character. Of course the use of antique lace has been a secret of historical costumers for years in taking a fragment of another era – with all its patience in meticulous designs – and applying it quickly to a modern-made garment. Period elegance and modern speed and durability are combined to create a hybrid to make its own memories in the material. In this wonderfully poetic case a young costume enthusiast bought an item buried in a vintage dealer’s stock that would follow her to industry success and eventually form part of a big-budget production viewed by millions across the world.